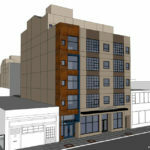 Having qualified for a streamlined environmental review and hearing, the proposed 45-unit ‘luxury community’ to rise at 3300 Broadway, along Oakland’s Auto Row, was approved by the city eight months ago and building permits for the projected $23.6 million development were requested. 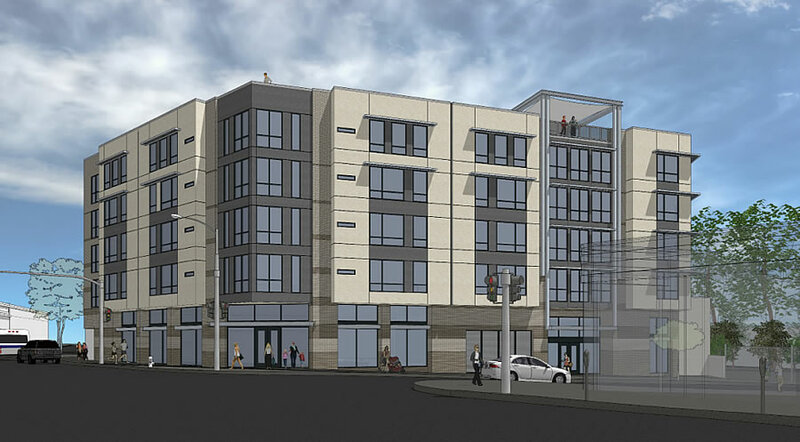 In addition to the 45 residential units, a mix of 15 one-bedrooms and 30 two, the approved plans for “The Echo” include 3,800 square feet of ground floor retail space fronting Broadway and a stacked garage for 46 cars. And while the project team was positioning to break ground earlier this year, the Broadway Corridor parcel and plans are now on the market with a $5.85 million tag. Build a 6% cap rate = $575K * .06 = 34,500 in profit per door per year. 34,500 * 150% = $51,750 in rent must be collected annually. $4,312.50 per month in rent must be collected. 15-20 minute walk from Bart, under and along two freeways in Oakland. I wonder if it will sell at this price? I think you’d be better off walking to 19th St (BART): it’s pretty much a wash on the distance and you’ll always have the option of hopping on a 51 if you lose interest. As for your math/speculation: sometimes things go up for sale b/c they’re more valuable, and sometimes b/c they’re less (and the seller hopes the buyer won’t realize it)…I suspect we’re drifting toward the latter. Do you mean real estate doesn’t always increase in value? You’re suggesting that real estate development is the vortex of easy money that I’ve been reading about. Looks like, it doesn’t it ?? But then we all know I’m something of a crank…much better to rely on the army of utterly objective observers who can differentiate b/w a trend and a cherry-picked sample…of six or seven hundred. Based on your numbers, no. There is too little cushion room — the likelihood of getting and maintaining those types of rents are a problem. Appreciate the posters who can actually do investment level math, rather than incessantly whine about traffic and car issues. Proximity to Sutter Health, Kaiser, Piedmont Ave are all good. So maybe the extra walk to BART won’t be that much of an issue. Hospitals ?? If that’s your major selling point I would think an extra block’s walk might be very much an issue (But hey, Albert Brown is up just a few hundred feet is you underestimate the stress level) Piedmont Ave, OTOH, which begins at this very property, should be a big amenity. If these guys were a little smarter they’d get a giant bike share dock installed out front. That would make travel time to 19th very fast. There’s also the uptown bike station, which is an excellent service, and free of charge. Where I think your analysis falls is the $50k impact fees. Definitely would be a lot higher after all the “community benefits” shakedown outfits get their fingers in. “under and along two freeways” – you have the wrong parcel. This is at Broadway and Brook St, it’s closer to Sprouts and hundreds of medical field jobs than a single freeway. If you were familiar with the area you’d know these units will be very popular as they’re in the middle of everything and very close to Piedmont Ave. You can be downtown on the 51 quickly and frequently or scoot to either BART station in 6 minutes. Good analysis. 6% cap rate is too high. This is likely a low to mid 4% cap rate these days for a largely residential, new construction property like this, though some upward cap rate pressure is here/coming due to rising interest rates. Also, building it with your assumptions doesn’t include a profit margin for the buyer/developer who takes it through to construction. Buyer would likely expect to build it, all in cost, at worst at 75-80% of its ultimate value. Will be interesting to see if they sell it and at what price. You build to a 6 cap and sell a 4 cap to slow money, or get your permanent financing based on the lower cap rate. That’s where your profit margin appears. 6 cap is admittedly not very exciting these days. Looks like the analysis ignores the 3,800 square foot commercial component. $100,000+/- NNN capitalized at 6% would increase the valuation $1.5 million, give or take. Am I missing something? Great point. 3,800sf * $400 psf to build = a cost to construct around $1.52mm plus impact fees, plus the $127K of basis as purchase that I included. 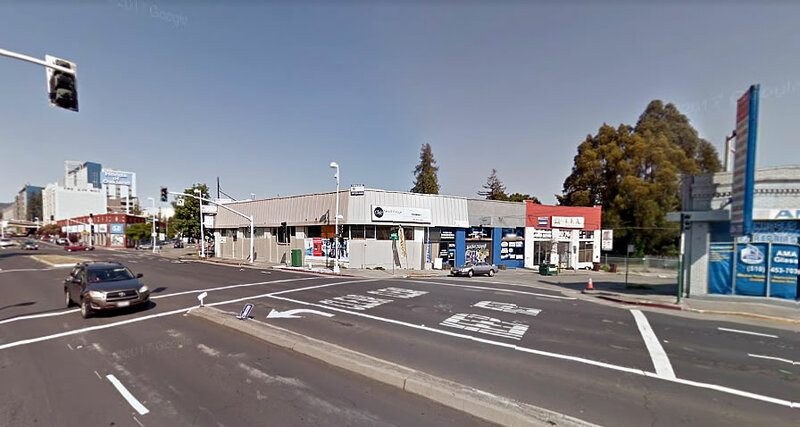 Then you need to find someone who will pay you $100K NNN to rent 3800sf across from an auto upholstery shop on Broadway in Oakland, so other than the negative value expense to build and a credit tenant, nothing could be easier. Slightly more optimistic phrasing: $100k NNN to rent 3800sf downstairs from 100 people. WAY more optimistic: across from ~500 people. But prudent investors probably don’t highball optimism. bach, could you open your eyes a bit more? The neighborhood already pulls higher than average per square foot rates and the space is across from hundreds of medical field jobs and a busy mid-priced supermarket. Most of the auto-related biz is being replaced by restaurants and/or apartments and in one case a very popular music venue Sound Room that’s relocating for the EastLine development. 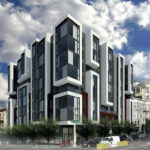 Oh and there’s 400+ units nearing completion right across Broadway and 127 more going up at 3000 Broadway. I am no expert in Oakland neighborhoods. I will be the first to recognize that. Do you rent nearby? What do you pay in rent (or what do you think is reasonable for new construction in the neighborhood?) Is it reasonable to expect $5+ psf in rent? That’s @$4,000+ for an 800sf apartment. What do you think is market rent for the 3,800sf commercial space when complete? I have no idea, but we have seen lots of these 5-story entitled podium sites go on the market in the bay area in the past 24 months. (High construction costs, increasing rates, negative legislative climate.) To me this seems overpriced a little, but again, I don’t know Oakland. In this area it’s more like 3-4 $/sf/mo, which you can easily verify from public listings. If the commercial component amounts to ‘negative value’ as suggested, how much would the ‘would-be’ developer have to pay you to take the 3,800 sf vanilla shell of his/her hands? We can argue what the value is – but if you start at zero, or lower, the argument stops right there. I don’t completely understand what you mean. There are obviously situations where the final constructed value of a building or space is less than the cost to construct it. I think the commercial space in this building is one of those instances. The commercial space might be worth $850K – but if it costs $1.6mm to build, my point is that the construction project has a ‘negative value’ of $750K. My experience is that people try to avoid knowingly losing money, except in the service of making even more money on a larger project. It doesn’t seem like the apartments offer much profit to offset the loss to be generated by building the commercial space. I expect this will neither sell within the current price context or be built in the next 4 years. I saw a lot of this during the dot com bust. A bunch of people had essentially made a straight line projection out ten years, assuming that everything would keep increasing at exactly the same rate forever, and they had made up their minds to sell at a certain point. Then the market stalled and headed back down before they reached it. So they got the entitlements and then tried to sell at the market peak + another 15%, which was halfway to their intended goal, even though the market was no longer even at the peak, hoping they’d find someone stupid enough to take it. No one ever did. That rings false, as if you’re conflating the dot-com bust with the sub-prime crisis and downturn. It was much easier to get things entitled during the dot-com era. I mean much, much, much easier. 10 minute walk to Cato’s on Piedmont or a 10 minute walk to Drake’s Dealership or a 12 minute walk to the bars and restaurants on 41st with Sprouts next door and easy access to the Freeway and 15 minute walk to BART and any build in this area is an easy sell. It’s exciting to see both Telegraph and especially Broadway coming to life.